The summer I finished high school, I was one of I think 120 graduating seniorsone girl and one boy from each state and territory of the U.S., plus a dozen more students of exceptional talent in the artsinvited to stay for nearly a week in Washington, D.C., to visit the White House and the Kennedy Center and other institutions in the capital, and to meet the Clintons at a ceremony recognizing us as that year's Presidential Scholars. I don't recall every part of the process that led to this selection, though I do remember that the final competitive piece involved an essay structured as a letter you would write to an important American. Eschewing the usual politicians and activists of the past, I composed my letter to my future child, attesting why I viewed her or him as the most important American I could imagine addressing and imparting some version of whatever I considered crucial traits to cultivate and petty distractions to avoid. I was partly inspired to write this by my parents' own thoughtful investments and candid confidences in me throughout my years of growing up, and also, I must confess, by having read The Bridges of Madison County two years prior, and feeling melodramatically moved to speculate what I would want my children to know about me, or to hear from my own voice. Twenty years later, neither having nor wanting any children who might inherit this story (such as it is), I may as well pass it to you. I don't remember a lot of that week's formal events, because my mind was quickly and completely elsewhere. On the first day, I met a woman representing a different state and was smitten like I had never been by anyone. Our first conversation was about favorite books, especially The Color Purple, As I Lay Dying, and Beloved. We also confessed having both cried through The Bridges of Madison County, which I had read while visiting an aunt who lived in the same city my new friend did. We had gathered this was the sort of book we were meant to disdain but we'd each enjoyed it, voluptuously. We were both stunned to be invited to these D.C. events but also a little flummoxed and bashful about all the formality. In an attempt to socialize all these nervous and unacquainted eggheads, the organizers of the program declared an impromptu dance contest in which everyone was required to participate. For my new friend and me, this was basically manna from heaven, with pomp and bunting pushed aside for Brandy and Salt 'n' Pepa, and we won. I loved everything about her, especially her compassionate and convivial conversation. I quickly memorized her full Yoruba first name, which had fifteen syllables. There was some other official event scheduled the third nightI think it involved meeting ambassadorsbut we just wanted to spend more time together during what remained of our five days, so we egregiously slipped out, jumped on a D.C. Metro train, and went to see The Bridges of Madison County, which had just opened. (Apologies, ambassadors!) We loved it start to finish and wept copiously through the last half-hour. I had not dated at all in high school, nor received the slightest hint that anyone was interested in me or ever would be. I was astonished to be so bowled over so quickly, and though I resented that we'd soon enroll in colleges thousands of miles away from each other, I also, being a teenager, savored the star-crossed aspect. At no point did I put into words the feelings I was having, and still today, I cannot vouch that she experienced this week as I did or would remember it the same way. We made a valiant stab at keeping up via e-mail during college and I saw her one more time on a trip during my first year of grad school. It's been years since we've written. Some light, tactful Googling suggests she's doing wonderfully, and performing exactly the high-level, open-minded, and health-oriented work that she dreamed of doing when we were teenagers. Of all the people in the world to whom I wish the very best, she's at or near the top of the list. It's hard to imagine more clement conditions in which to see The Bridges of Madison County. I was so overwhelmed by the symmetry I felt with my own circumstanceson a date I was too nervous to call a date with someone I'd grown entirely besotted with, literally overnight, but with only 48 hours or so left in her company. I was reassured to see Bridges again the following February, rolled out for an awards-season re-release, and to perceive a genuinely impressive movie, not just a sepia-toned screen for my adolescent projections. That said, the movie makes me feel tender toward adolescent projections, mine and other people's. On the page, despite or even because of Robert James Waller's meretricious prose, Bridges radiates a common yearning for romantic communion, the desire to sublimate an encounter as something ineffable and unprecedented, graspable only to the people involvedor to one of those people, lavishly hoping these feelings are returned, but not actually asking. One could snicker at all this excess, or at books so purple as to have a man say I am the highway and a peregrine and all the sails that ever went to sea, and have a woman swoon at this doggerel. But I've never snickered at Madison County on film. The movie reaped well-earned praise for recentering the story in Francesca's perspective, where any semblance of conflict lies, and for slaking the novel's effulgent rhetoric. Still, even Eastwood's version benefits from generosity. I've never been as turned off by the framing sequences with Francesca's grown children as many people are (in fact, I think Annie Corley is pretty wonderful as the adult Carolyn), but if I grant something pedestrian and device-like in them, it only heightens what is special, slower, exquisite, and sonorous in Francesca's embedded interlude with Robert. When I recently interviewed Todd Haynes, he spoke about consuming all those 1940s woman-centered weepies like Letter from an Unknown Woman and Now, Voyager, where a woman's unsustainable romantic obsession, her hermeneutic craving to read everything into and about her partner, was both gratifying and cautionary. I'm glad I was raised into romantic life by Francesca Johnson rather than Lisa Berndle or Charlotte Vale. Francesca's too old and insufficiently neurotic to turn Robert into a maddening fetish or to omit the boundaries between her and him, even as she gives over to desire. Sure, her age might have deterred me as a 17-year-old from identifying. My partner of 16 years, having recently seen the film for the first time, expressed his bewilderment that this was what I was watching on loop for years while my peers were having actual liaisons rather than vicarious ones, and making the most of their youth. But that wasn't my experience at all. As a total naïf, I appreciated seeing through Francesca's eyes that love could be all-encompassing, as they say, but not all-effacing. You could, and should, hold onto who you are and make decisions you can live by, especially in the interests of those who matter mosta category that hopefully includes but is not limited to you. This is equally good advice in the relationships you preserve as in those you break off. Bridges, then, actually stoked my imagination at two different levelsnot just what infatuation would feel like, and suddenly did feel like, but what maturity would feel like. Finishing high school and heading off to college was a predictable time to embrace freedom and possibility and go about discovering who I was or what I could become. I did plenty of that, with the movies as a regular chaperone and sounding-board. But I also experienced it as a time of shifted and intense curiosity about my parents, of admiration verging on reverence for my professors and bosses, and of curiosity about everyone around me with life experience under their belts, even those I had previously taken for granted. The Presidential Scholars Program allowed you to bring a teacher to the White House so that they, too, could be honored, and I remember thinking as much that week about what this all must mean to my beloved Ms. Portwood, decades into a vocation to which she'd given everything, as I did what it meant for me. I hoped I'd do something that I'd still be proud to avow as a calling when I'd been at it for many years. (That part has turned out to be true.) While watching Bridges, I was interested not just in Francesca's viewpoint and, somewhat less so, in Robert's, but in Richard LaGravenese's, who was wise enough to see how this story could be preserved and transformed at the same time, and made more serious and truthful in the process. I was newly fascinated by Streep and Eastwood, who seemed to plumb a lot in a story that was all about middle age, and self-consciously exposed the audience to sensualities in her and vulnerabilites in him that we hadn't previously seen. I wondered if people in and around Iowaespecially, as Francesca says, "housewives in the middle of nowhere"felt respected or stereotyped by the movie's representations of their landscapes, households, and choices. I wondered about all the people across America who were making Bridges into a hit during the same summer when I was paid to give away frosted Batman Forever mugs with every McDonalds Value Meal. The book that had sold like $1 cheeseburgers three years before was already a target of mass contempt. So why was everybody heading to the movie? Given the extreme particularity of my own experience with the film, I wondered what was private and specific in these folks' experiences. 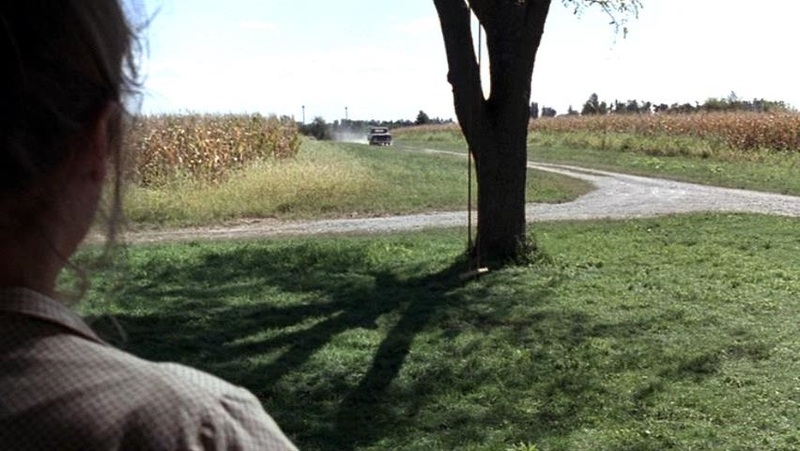 I'm focusing more here on what The Bridges of Madison County means to me than on why I admire it, but I cannot possibly overlook the rainswept climax with the pickups, the stoplight, and the fist curled around a door handlefor my money, one of the most perfect sequences in modern American movies. I still can't watch it without water-damaging the entire area I'm sitting in. Part of why that passage resonates so much is that Francesca's choice is genuinely difficult, all the more so because Eastwood's Bridges has nothing against her husband Richard, beautifully played by Jim Haynie; so many other actors and filmmakers would have sold that character short. I've never experienced that moment as a choice between men, primarily, but as a moment of Choice, period. It works because the movie isn't about the guys but about Francesca, the decider, and the reasons we've come to understand why she will elect as she does, and what she gains and loses in that election. The movie refrains from editorializing about any sense in which her choice was right or wrong, and doesn't use words like "happy" or "unhappy" for the life that follows. Few movies are so mature or non-judgmental in the way they frame a pivotal decision. I haven't faced many choices that stark in my life. When I have, they're often only visible to me in retrospect. It's tempting of course to think about a road not takenwith zero regret, but with curiositywhen I recall a hypothetical life that a 17-year-old version of me imagined so avidly, maybe with this woman I knew for a week, maybe with the children to whom I'd already started speaking, even now that I've been blissfully partnered for so long with the man I love (who is also, happily, despite all my fondness for Richard Johnson, no Richard Johnson). Some college friends with whom I shared this story viewed my coming out shortly afterward as ironic, though I'm more into feelings than labels, and I've never seen it that way. At key points in life, you pull a handle or don't. Haynes talked to me about this, too: how U.S. reactionaries have made "choice" such a radioactive word in sexual contexts, refusing to recognize LGBT desires as anything but willful and reversible preference, that we don't admit how much choice is necessarily involved in any romance, any experience. Having a life, a partner, and a community you love and that you continually choose doesn't mean other lives would have been impossible or unhappy. Some people are comforted by ideas of fate, resolution, and fixity. I'm much more comforted by feeling enraptured and lucky for what I have, while embracing the contingency of the world and knowing things might have been otherwise. You can't have every life, and you don't need to. You're fortunate to treasure the one you're in, which doesn't prohibit occasionally contemplating others, or thinking fondly on what might have been. I learned this, among other places, in Madison County, and from a brief, extraordinary friend of my youth who preoccupied me more than the President did, and whom I've thought about at every dance party since, and while re-opening most of my favorite books. I'm so grateful for long-ago rushes of youthful excitement, and for listening to elders even when I was amidst them, and for keeping my eyes and ears open at the movies, even those with a penumbra of disrepute. As Francesca instructs by example, you have to know and embrace who you are, and protect the people and things that are valuable to you. But you can do that while preserving memories and imaginings from other lives.